(Nanowerk News) A new technology, which creates a rainbow of optical colors with ultra-thin layers of silicon, has been recently demonstrated by a research group at the University of Alabama in Huntsville (UAH). “The reason we chose silicon is not only because silicon is a low cost material and has been widely used in electronics industry, but also most importantly, silicon is an indirect bandgap semiconductor material with both high index of refraction and low optical absorption in the visible spectrum. The combination of high index of refraction and low absorption enables strong optical wave interference inside ultra-thin silicon films, a physical process that results in colors,” says Dr. Junpeng Guo, professor of electrical engineering and optics, who has published the result with his graduate student, Seyed Sadreddin Mirshafieyan, in a recent issue of Optics Express ("Silicon colors: spectral selective perfect light absorption in single layer silicon films on aluminum surface and its thermal tunability"). 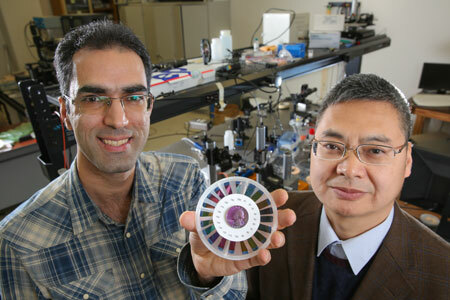 “The reason these colors are so vibrant, is because one wavelength of light is completely absorbed,” explains Dr. Guo, while his student holds a collection of color samples. “And the colors are very durable. A lot of colors you see in nature are due to wavelength selective light absorption in organic molecules which cannot withstand high temperatures,” he says. Ultraviolet light destroys organic dye molecules over time, leading to color change and fading. The new technology may hold promise for many applications such as for jewelry, automotive interior trim, aviation, signage, colored keypads, electronics and wearable displays.